You have chosen to enter the suite via Parks Airport, East St. Louis, IL. Spend some time here by clicking any or all of the navigation buttons at the top and right of any page. When you are finished, you may come back here and direct your browser to the other sites tabulated, summarized and linked from the table below. In aggregate, these Registers recorded flight activity around the United States from 1925 to 1942. Web exposure of the Parks Airport Register began some years ago with Terry Bowden (blog link, left sidebar). His blog shares several additional links and articles documenting the Register. For example, click the "aviation history" link at his blog and scroll down to NR6239. WHAT AIRFIELDS & REGISTERS CAN BE INVESTIGATED? Please refer to the table below. Each interactive site stands alone. Each is crafted as an attractive and engaging exposition of 20th century aviation history. However, important linkages are made among the sites. You will delight in discovering the overlap in the movements of people and aircraft from airfield to airfield, across the United States. The linkages clearly reveal the patterns of air traffic and, more broadly, the evolution of civil, commercial and military aviation in the United States during what historians call the Golden Age of Flight, nominally between the years 1920 and 1940. 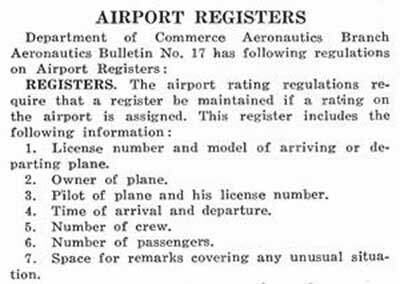 WHAT IS THE PARKS AIRPORT REGISTER? 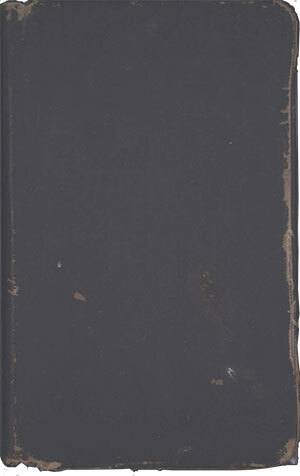 The Parks Airport Register was an approximately 8.5 by 11 inch, bound book. The book lay open from May 24, 1929 to September 10, 1937; a total of 3,031 days. You may view each of its pages at the REGISTER button at upper right. It was ruled into rows and columns with headers across two facing pages that specified the information for pilots to enter. Below, an image of part of the first pair of facing pages with pilot signatures from May 24-29, 1929. If you think the sample above is difficult to read, then welcome to my world. None of the other Registers in the set were easy reads either. The good news is, I have done the reading and interpretation for you and all the names, dates, locations and aircraft registration numbers are in databases that drive all the sites. You have access to the databases through the buttons for PEOPLE, PLACES, etc. at upper right. The surviving Parks Airport Register is 69 pages plus front and back hard covers. As you can see from the front cover at left, this was a simple, fabric-covered book that saw some wear over the eight or so years it lay open at East St. Louis. This was not a fancy ledger with leather cover and gold-embossed title (to see one of those, click on the Davis-Monthan Airfield Register link in the table above). Fourteen pages of the Parks Airport Register were blank, so they were not counted or imaged for this site. Thus, when you explore the REGISTER button, above right, you will see only the 55 pages that were written upon. It is unknown if other pages or books existed earlier or later. There were 1,141 landings recorded in this Register. The landings were made by civilian pilots (1,026), military pilots (73) and female pilots (42). As you work through the Parks Airport Register, you will probably recognize many of their names. Your Webmaster’s copy of the Parks Airport Register was acquired in 2007. Many thanks to Terry Bowden and the St. Louis University Library (cited, left sidebar) for facilitating the acquisition, which now allows us to learn about and to build upon our knowledge of the key role St. Louis played during the Golden Age of Aviation. WHAT WAS PARKS Airport? Parks Airport takes its name from Oliver Parks. 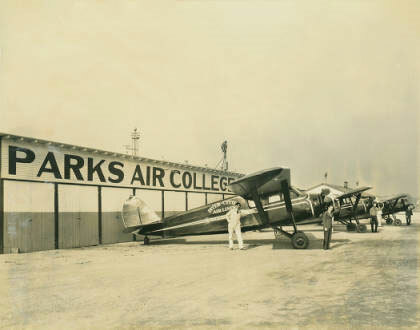 Parks had become well known for creating Parks Air College, the Airport, and an aircraft manufacturing plant producing four models of Parks aircraft, all of which were organized under Parks Air Lines, Inc. At right, from the St. Louis University (SLU) Libraries Digital Collection, is a photograph of aircraft on the ramp at Parks College. The caption for the photograph states, "Parks College Aircraft used for the Executive Pilot Program lined up on the runway outside of the Parks Hangar, late 1930s." Called variously Parks Field, Parks College Airport or Parks Airport, the field was located in East St. Louis, Illinois. Please follow the link to learn about its geography and see then and now photographs of the Airport. It was founded in 1927, during the wave of interest growing in aviation after Charles Lindbergh’s trans-Atlantic flight. 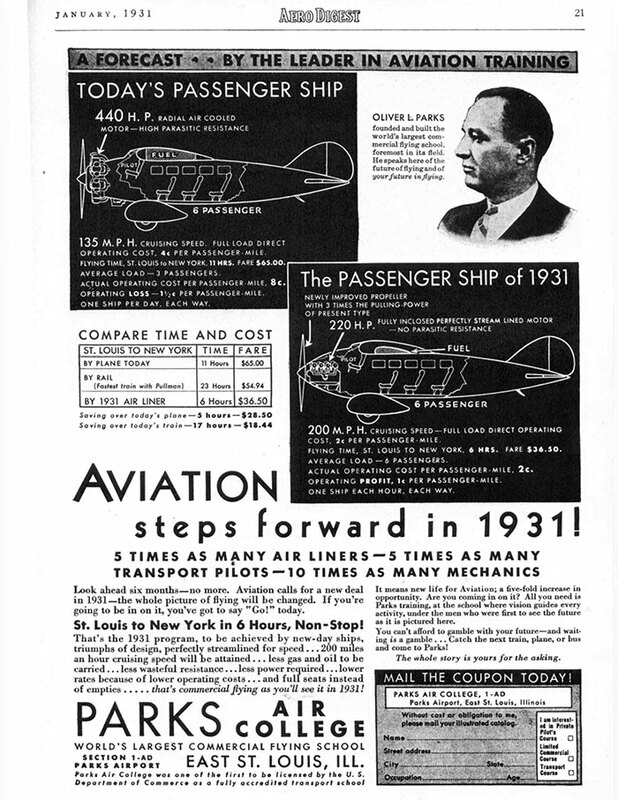 Below, a full-page advertisement for Parks Air College from Aero Digest magazine for January, 1931. Oliver Parks is pictured. The comparison of "old" and "new" transport hardware is instructive, if not optimistic. Parks College closed its campus in 1992. An aerial photograph of Parks Airport taken in 1938 (REFERENCE) is at right. The view is to the southeast. The faint outlines of two crushed rock runways can be seen; one running north south and the other east west (the white arrow at field center points north). The runways were barely a half-mile long. Today the property occupied by the original airfield lies south and east of the intersection of route 157 and Falling Springs Rd. about 2.25 miles due east of the Mississippi River. It is pretty much surrounded now by housing, but is not built up itself. Remains of the original north-south runway are visible today, as well as just a hint of the east-west runway. One of the old hangar buildings still exists. Please visit the link to Parks Airport above to see modern, Google Earth views of the site. WHY BE INTERESTED IN MUSTY, OLD BOOKS? Each Register is a microcosm of Golden Age aviation history, recorded in the first-person, by the very actors who made that history. Study of Golden Age people in aviation points to an aerial “lifeway,” including shared values, clothing styles, politics, interests, vocabulary and perhaps even diet and social skills. Being a pilot in those early days was like belonging to an adventure-based brotherhood. But, men did not have a lock on camaraderie. The female pilots, although there weren’t as many of them, shared an equivalent sisterhood that, in many ways, was just a powerful as their male counterparts. That the women and their exploits were newsworthy at the time is made abundantly clear by the sheer numbers of newspaper and magazine articles and books published. As an example, in one small study I performed, The New York Times published 1,265 articles about female aviators during the 10-year period of the Davis-Monthan Register (1925-1936), an average of three a week. And that is just one newspaper and one small group of aviators. The machines flown were the best technologies of their time, and the pilots used them in some spectacular, innovative ways. Most of their aircraft lived hard, short lives. Only a very small percentage exist today, and they and their sister ships are featured on the sites whenever and wherever I find them. Whereas the Web is infinitely wide, it is many times only a few centimeters deep. Each Register and its associated Web site gives us an opportunity to dive into a deep, virtual pool of information to enjoy meeting the characters and hardware that shaped aeronautical science across the United States through the 20th and into the 21st century. Their influence is palpable today, and will be tomorrow, as we go to the planets and beyond. PLEASE NOTE: As of the upload date of this page, the Web site of the Davis-Monthan Airfield Register has been online eight years, since May 4, 2005. It presents over 1,000 pages of pilot biographies and other topics, which have been added incrementally over the years. The new sites tabulated above have less content now, but they will grow over the coming years. Additions and changes to the sites are always posted at the "WHAT'S NEW ON THE SITE?" links on each site. Please bookmark the "What's New on the Site?" pages and come back regularly. All Web pages are designed by your Webmaster and implemented by The Web Professional, Inc., Naples, FL & St. Paul, MN. All Web sites are wholly owned, sourced, researched, written and operated by Delta Mike Airfield, Inc., a 501(c)3 non-profit educational company based in Naples, FL. Unless otherwise noted, all designs and original texts and images are Copyright © Delta Mike Airfield, Inc. The mission of the company is education, encouragement and support of historical aviation research and multi-media publication to enhance knowledge among public and private sectors around the globe. Specific emphasis is on the Golden Age of Flight. The company operates primarily, but not exclusively, through its Web sites. Other mixed media publications and public appearances also support the Company. Your donations can be made through any of the Web sites. One-hundred percent of your donations go to support the Company's mission. WHO HAS VISITED THE SITE?